The Michigan connection to the North Pole! 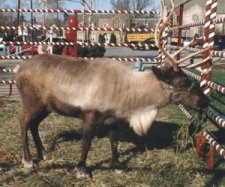 Live Reindeer available for Events, Parties and Promotions Year Round in the State of Michigan. Also National Reindeer Sales and Breeding. The Perfect Fund Raising Tool! Comet, Cupid, Donder and Blitzen! Let us not forget Rudolph, too! 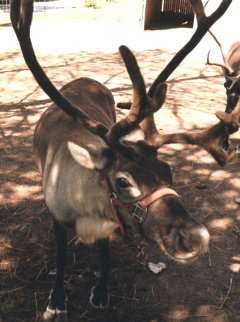 Why not invite some of Santa’s World famous live reindeer to your next Holiday Celebration! These magnificent animals are specially conditioned and completely friendly in their Candy Cane Corral! We will help you create a magical unforgettable moment like no other this Yuletide Season for all the good boys and girls that will attend your event. Let Santa's Christmas Farm (Santa's other place) take care of every-thing so you can enjoy your event! Our special Reindeer Packages let you select just the right magic for your event or we can help build you a special Holiday package! Santa's live reindeer are perfect for Parties, Schools, Shopping Centers, Company Gatherings, Parades, Tree Lightings, Civic Events and Business Promotions. We are also available in the off-season for Christmas in July*, Trade Shows, Theme Parks, Movies, Printed Advertising and Commercial Filming. Santa's trained staff will set up and clean up your reindeer event or promotion from start to finish. Santa's live reindeer will entertain while their handlers educate your guests and answer any questions they might have about the Reindeer. All our packages include two (2) reindeer, handlers and our attractive Candy Cane Corral set-ups. We are Michigan's Premier live Reindeer providers and planners for all sorts of Christmas celebrations. Ask about our special Santa’s Reindeer feeding and photo opportunities! Please contact us with your special plans. "We make magical Christmas memories that will last a lifetime!" Copyright © 2010 Santa & Co. LLC. All rights reserved.